Franz Lachner was born into a musical family. His father Anton Lachner was an organist and he gave him his first musical education. His brothers Ignaz and Vinzenz became composers like himself. He attended the gymnasium at Neuburg an der Donau and studied composition under Eisenhofer. After his father died in 1822 he went to Munich where he continued his studies and worked as a music teacher. In 1823 he became a church organist in Vienna and in that city he studied with Simon Sechter and Maximiliam Stadler. He befriended Schubert and was also in contact with Beethoven. In 1828 he became first master of the choir at the Kärtnertortheater. 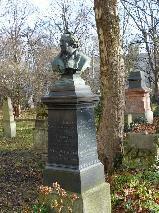 From 1834 to 1836 he was master of the choir in Mannheim. In 1836 he returned to Munich where he was appointer conductor of the Court Opera. In 1852 he became general musical director in Munich. He was also active as a teacher and among his pupils were Joseph Rheinberger and Franz Wüllner. Allthough he rejected Richard Wagner's music he had performed his opera's succesfully, but he asked for retirement in 1868 after king Ludwig II asked Wagner to come to Munich. His retirement was granted and he continued to work as a composer. He died in Munich in 1890. The grave of Franz von Lachner at the Alte Südfriedhof, Munich.